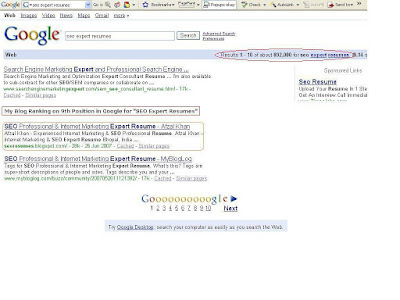 Google Rankings for "SEO Expert Resume Blog"
My SEO Expert Resumes ranking on 2nd position in Google for keyphrase "SEO Expert Resumes & SEO Expert Resume Blog" Since I had optimized this blog to get rank at # 1 in Google, so I am not concerned much about Yahoo, MSN or other search engine rankings. As far my experience says, if you can bring your site or blog ranking on Google, you can achieve that so easily on other search engines. Although every site is optimized based on target search engines, since every search engine is having their own Algorithm to provide rankings. Like Google & Yahoo the both displays different results altogether for same Keyword, also no official from these Search Engines reveals their algorithm. It's all about reading articles & keeping watch on latest trends from Search Engine World, and most importantly it's the result displayed by search engines for my other Client's website. It's all about dedicating myself for search engines and applying that knowledge which I gained from various pros & cons. Do check my other Blogs for which I am sure to achieve better rankings soon. Listof All Bloggers - An attempt to make collection of blogger's Submit your lists for publication on Afzal-Khan LISTOFF! If they're funny enough, smart enough, and creative enough, you'll see your very own list crediting YOU and YOUR BLOG. Send lists to: afzal.bpl@gmail.com On your mark, see you at: Afzal-Khan LISTOFF! Blog. Collection of My photographs taken on various outings.